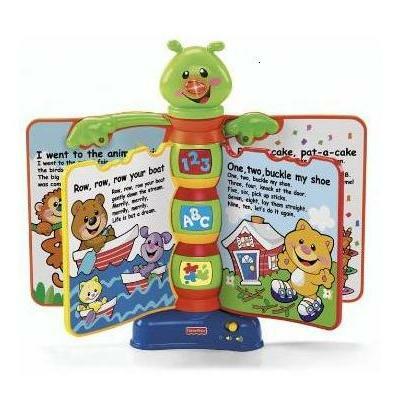  The Fisher-Price Storybook Rhymes teaches the letters of the alphabet and words.  Pages can be flipped just like with a book. The Fisher Price Laugh and Learn Storybook Rhymes (for 6 months old up to 4 years old) is educational. It teaches letters and words, numbers, color, etc. It also produces beautiful melodies and has flashing lights which babies and young children usually enjoy. What we also like about this electronic rhyming book is that children can flip the pages just like with a book and therefore they can develop a love for reading early on.